When the South African cricket team thrashed Australia recently, it was a victory celebrated by the whole of South Africa. However, that was not always the case. Professor Andre Odendaal and his fellow authors will launch ”Divided Country” on Friday. The book tells the history of South African cricket between 1914 and 1950 when there were unbelievably seven Cricket South Africa’s split along racial and gender lines, each playing its own tournaments and leagues and selecting its own national teams. ”Divided Country” is Volume Two of the history of cricket in South Africa – a book written by Professor Andre Odendaal, Krish Reddy and Christopher Merrett. The first volume was a book called ”Cricket and Conquest” which covered the period from 1795 to 1914. The book documented colonialism at its worst with Cecil John Rhodes at the helm and how cricket in South Africa had been formed by colonialism, imperialism, racism, the superiority of the English and then segregation through apartheid. “Today, we know the SA team bats for all cricketers in SA, but it was not always so. In the 1950’s, there was a white only male SA (team) called Saca; there was a coloured, Muslim, SA (team) called SACB which was forced to become the Malay cricket board; there was the SA coloured cricket association formed in 1926; there was a SA Indian cricket union; the SA Bantu Union which in the 60’s became the African Union; there was the SA/Rhodesia women’s cricket association for white women only, and finally there was an inter-race SA called SACB, later called SACBOC. It was an absolute jumble with seven different organisations in the same cities and towns each running their own leagues and inter-provincial tournaments each selecting their own national teams. Some of them have never been known about a lot. Now, for the first time, there is a coherent history, statistical appendage of 65 tournaments by these black and omen cricketers. We had to sweat blood in newspapers, old scorebooks, wardrobes and suitcases.We have reasserted people to history where they have been erased not by accident, but as a deliberate part of colonial and apartheid thinking and action,” says author Professor Andre Ondendaal. The book deals with both World Wars and the hardships it brought; how Indians were discriminated against and how they only became citizens in 1961, 100 years after arriving in South Africa. They were based mainly in Durban and Johannesburg and were not allowed in the Free State. They were resilient and their love for the game of cricket shone through against all odds. White women started playing cricket in 1952. The gentleman’s game, however, was real and while women were allowed to play hockey, golf and tennis, there was tremendous opposition to women playing the cricket. African women were also involved in the game, but not in an organised forum. It was only in 2005 that women finally found a place in world cricket when the International Women’s Cricket Council became part of the ICC. ”Divided Country” also tells some amazing cricketing stories about matches and players that affected countries on a global scale. ”Divided Country” is a book that bowls out the existing history in SA cricket. It helps to decolonise the game and creates a past that will never be the same again. It will hopefully help change mentalities and attitudes and the ownership of cricket in South Africa today – a game to be cherished by all South Africans. 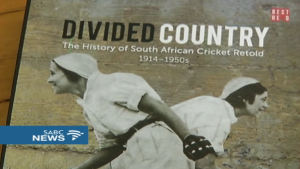 The post Book ‘Divided Country’ revisits history of SA cricket appeared first on SABC News – Breaking news, special reports, world, business, sport coverage of all South African current events. Africa's news leader..